Video performance is further enhanced with the ability to manually adjust your exposure settings and audio levels while recording. By employing Live View, you can view your recording on the LCD and make settings changes with a dedicated menu tab on the fly. The DIGIC 5+ processor also dramatically improves video response times and helps to reduce color artifacts, aberrations, and moir. 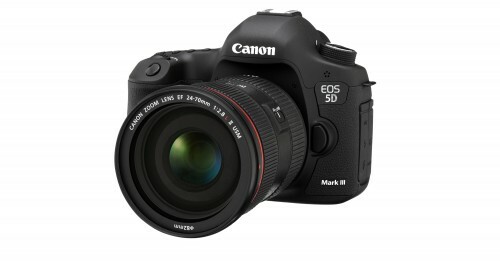 The 5D Mark III also boasts a dual-axis electronic level indicator displaying vertical and horizontal tilt on the LCD monitor--either alone or during Live View shooting. The indicator may also be displayed in the intelligent viewfinder, if you prefer. Canon's Dual Axis Electronic Level can also be used in conjunction with the Intelligent Viewfinder and visually displays pitch and roll angles, aiding in properly level horizons. When used in the viewfinder, this feature can display +/- 6 of roll and +/- 4 of pitch in 1 increments when held horizontally (the inverse is shown when held vertically). The electronic level is particularly useful for landscape photographers and those working with tilt and shift lenses whose angle of view is especially critical. The expanded 3.2" Clear View II LCD provides high quality viewing with a 1,040,000-dot resolution and anti-reflection coating. This allows for sharp and clear viewing in even the brightest of conditions and displays images and videos with great detail and richness. The display also features a viewing angle up to 170 for review from the side or below. The Dual Axis Electronic Level is also functional in on the LCD and can display a full 360 of roll and +/- 10 of pitch in 1 increments. When used in conjunction with Live View mode, a smaller display is placed over the image. Live View mode permits real-time image review and can also place grid lines over the image for compositional help. You can also zoom into and navigate within the image when in Live View and use the grid lines for minute control and precision over the alignment of your photograph.